Enter the details you would like to appear on your certificate below. Contact us if you would like extra copies of the certificate. Check your text carefully for spelling, punctuation, and capitalization. Text on certificate will appear exactly as typed. 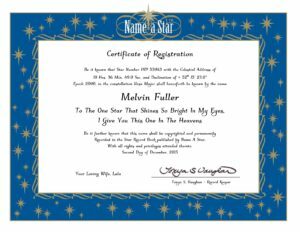 Enter the text that you would like to appear on the certificate under the star name. Choose an honorary date for this star in the past, present, or future. Choose what constellation you would like your star to be from. Choose the language you would like your certificate to use. Enter your name here to sign digitally. The exact Celestial Address of the star in the sky. The name of the Constellation in which your star is found. The name you give to your star. The personal message or tribute you write. Sample Tributes. The Date you choose to commemorate. Your From Lines and/or Signature, which we can either print or leave blank for you to hand sign. Certificate of Registration. 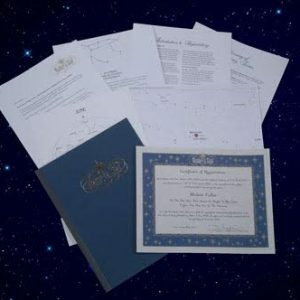 Each Certificate of Registration is customized with a personal message or tribute that you write. Star charts marked with the location of your star, so you can find it in the night sky. A star chart showing the constellation in which your star is located along with the celestial address of your star. A description of the Constellation including what it represents and who or what it was named for. Thanks for visiting our new website. We have earned lots of great reviews over the last 38 years. Visit our Customer Comments page to see a sampling. After you order, please come back to enter your own review. Our daughter fell in love with her turtle! Your ordering process was simple to follow and we received it faster than expected. Thanks so much!! Thanks for the feedback. Glad your daughter is enjoying her turtle. Jason plays with his new red car constantly. It was a fun gift and we appreciated the customer service. Thanks for the review. We are happy that Jason is enjoying his gift from you. What a great gift for our new Granddaughter to celebrate her first birthday. Happy with the ordering process and it showed up in time, even though I’d procrastinated until the last minute. She LOVES her bunny! 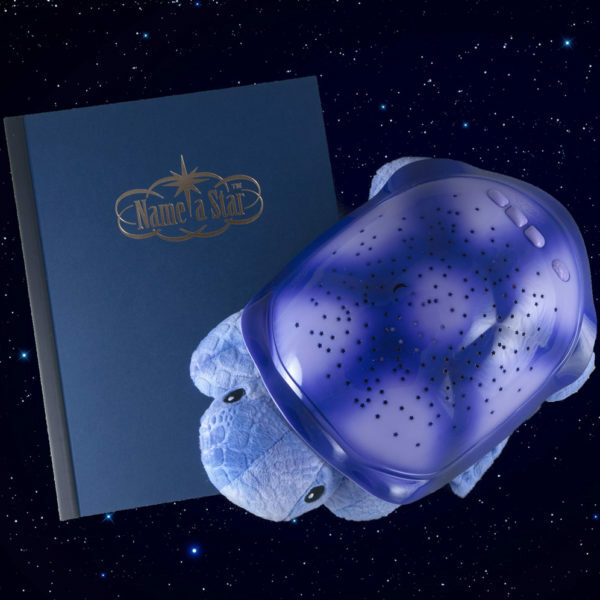 It is fun for us to hear when a child loves their Star Projection Toy and has an opportunity to learn about the night sky. Thanks for sharing. I have ordered several stars and products from you over the years. I have never been disappointed. Shipping is always super fast. Also, I love the instant certificates for last minute gifts. I have and will continue to recommend your company to all my family and friends! Thank you!! Thanks for the great feedback. 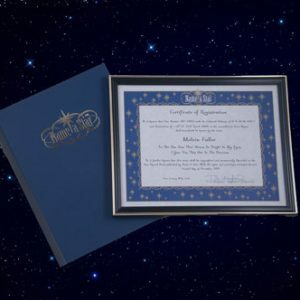 Our goal is to bring joy to all of our customers and the recipients of their star naming gift. We were trying to get my daughter to stay in her own bed at night. We came across Twilight Ladybug product online. It was just what she needed to help her fall asleep. She now looks forward to bedtime! Thank you so much! Thanks for your comments. 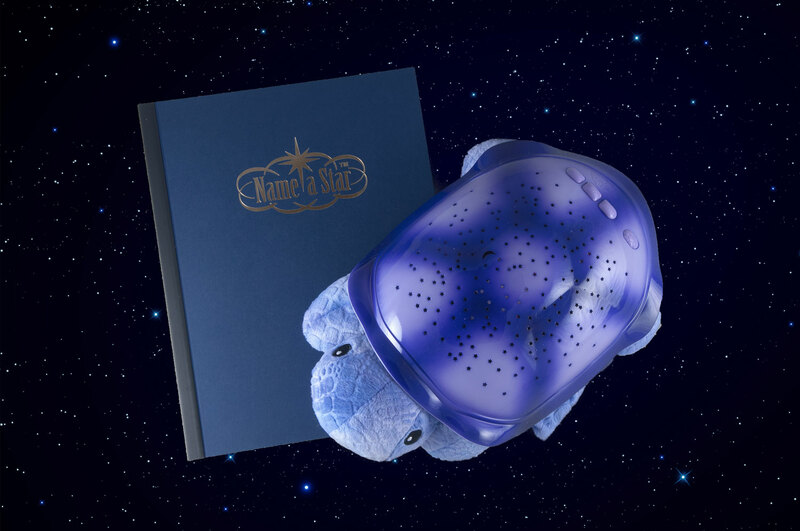 It is nice to know that the Star Projection Toy is helping your daughter sleep at night. Wow! What a great gift idea! Asked to be godparents at the last minute, we were very grateful for the prompt delivery of the STAR package! The parents of our godchild were so touched by the lovely certificate and specialness of the gift! I sent several guests to your web site during the christening reception! Thanks you, the Name A Star, your a lifesaver! Happy to hear that Name a Star was well received by the christening parents. Thank Name a Star for making Employee of the Year a coveted award. As a startup we tried to keep it all in the family and it had the desired effect. Now people are already vying for next year’s Star. Thank you for the professional presentation and outstanding service. Thanks for letting us know that Name a Star was an inspiration business award for your employees. This is the 4th star I have had named, I thought it would be something cool and special to do for a grandchild’s 1st Christmas and now have 4! 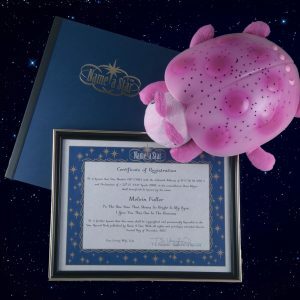 I have always had a great experience with your company and the little ones love their projection toy, and I think will appreciate having their own star when they get older!! Thank you for your prompt delivery and easy to order web site! !